When you’re searching for a cordless electric linear-style razor, without an additional cleaning unit, the Panasonic ES-LF51-A provides solid technology in a compact unit. Panasonic a good brand, still made in Japan, and one that still remains trusted for its well-made, long-lasting small appliances. You’ll want to test a variety of different electric shavers before buying, but you could still blindly buy the Panasonic ES-LF51-A in the box and not be disappointed. 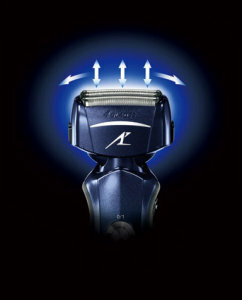 This shaver is built with 4 “nano” blades at a 30 degree angle, with an ultra-thin foil cutting system. A flexible pivoting head will follow the contours of your face, getting any stray hairs. This pivoting technology is actually a really neat feature if you haven’t tried a shaver with a pivot head before. It definitely makes shaving a whole lot easier, particularly when one is quite tired first thing in the morning. 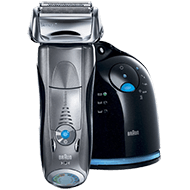 Some electric shavers just aren’t built for men who wish to trim existing facial hair, but the Panasonic ES-LF51-A performs well in that regard. 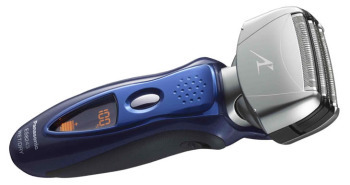 A separate slide up trimmer is handy for cutting mustache, sideburns, or beard. 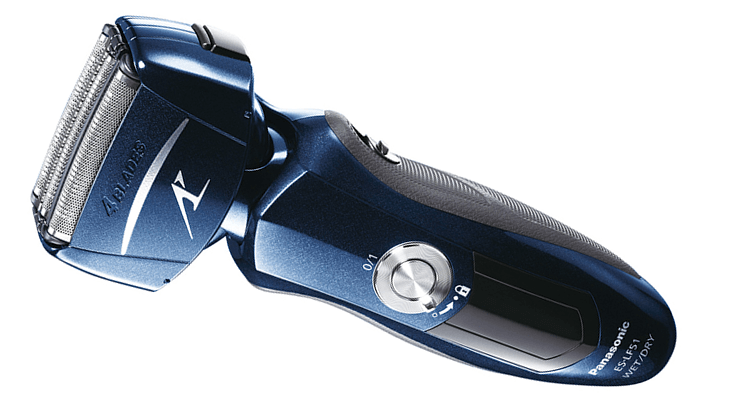 The shaver is also built with a slit foil, which is perfect for catching long beards and giving a good trim. The Panasonic ES-LF51-A is built with a Panasonic CPM linear motor driver that promises to last for several years, with the proper care. It’s fast 14,000 cycles per minute will give you a quick clean shave, without tugging or yanking at hairs that can be so annoying with cheaper electric shavers. An LED readout battery display will help you choose five different levels of shaving. There’s also a lock button, so you don’t accidentally turn on your electric shaver during transit. 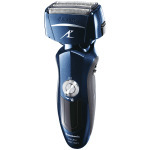 This Panasonic ES-LF51-A can be used cordless in either wet or dry modes, as well as being used with shaving lotions, moisturizers, and shaving foams to provide a more closer shave. 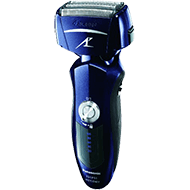 The shaver is made with hypoallergenic blades and foils so that there will be fewer chances for the skin to become inflamed or irritated. The Panasonic ES-LF51-A is super easy to clean, and has a special sonic vibration cleaning mode. Simply turn it to the cleaning mode and rinse under a tap. The foil and switch can both be removed to get inside the interior to rinse the blades under tap water. The sonic vibration mode will allow you to get at those tiny hairs much easier. The shaver is safe to use wet or dry and is 100% waterproof, though completely immersing the shaver under water isn’t recommended. 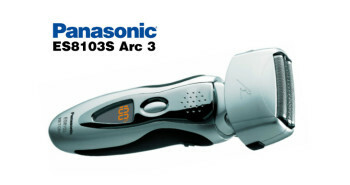 The Panasonic ES-LF51-A package includes one electric shaver, an AC adaptor, and a convenient travel pouch. 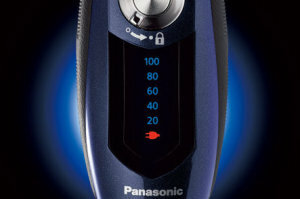 The Panasonic ES-LF51-A is built with a 5-stage LED indicator display, has a switch-lock button to lock it up, and a pop-up trimmer. Panasonic recommends that for optimum usage, that the foils and blades be replaced at least once a year. Optional foils and blades can be purchased quite easily with the electric shaver, so be sure to buy some during the purchase of your shaver, so you’ll be better prepared for next year. 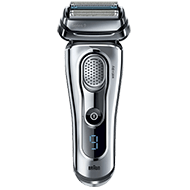 Overall, the Panasonic ES-LF51-A is a great linear-style shaver, and you can’t really go wrong with Japanese Panasonic technology. Whether you buy this shaver by name only, or choose to try a demo model in-store first, you’ll be pleasantly surprised by how well this shaver performs.